At the beginning of this month I wrote how I had started off some hardy annuals from the Higgledy Garden ‘Seeds to Sow in September’ range. Not only was this because I wanted to get some of my cut flower seeds off to a good start next year, but also because I had finally managed to reclaim a large section of the allotment, and wanted to feel it was being productive. Furthermore, being a bit of a romantic, I have this vision of what my allotment will look like next year ( I will seek out an appropriate image) and the sooner I can feel I’m well and truly on my way to this flowery utopia the happier I will be. It was going well. Everything germinated. I’d sown Calendula, Larkspur, Cornflowers and Nigella, and marked up those from Sarah Raven and those from Higgledy Garden just to compare notes on performance – as you do. As I walked to and from the station I was able to watch the progress of the seeds, and was quietly confident. Just over a week ago I was stopping off every couple of evenings to water them. But then we’ve had some rain. And whilst this little corner of Surrey has had nothing like the deluge that other parts of the country have suffered, when I returned to the allotment today to work on easing out the weeds that had the cheek to try and re-establish themselves in my cut flower patch, it appears that it was enough for most of my seeds to retreat back beneath the surface again! Either that, or something has been feasting on them. It is very frustrating. The same has happened in the garden. I’d sown a seed tray full of Papaver rhoeas ‘Bridal Silk’ – they were safe inside a cold frame, and all but two have vanished. I can only think that slugs or snails have had them. So the second batch are in the shed. However it is not all bleak. I am very pleased to see that the seeds I sowed from the Lunaria annua ‘Variegata’ have germinated. They are in one of my cold frames in the garden where I can keep a close eye on them. I bought the plant from a RHS Westminster show in the Spring, it was expensive for an annual, and on the scrawny side only managing one flower stem. However when it gave up the ghost I saved the stem, drying it off in the shed, and so far so good. From my recollection the seeds do come true; I will update in due course. And on the allotment I’m pleased to say that the Calendula have come on a treat, and the Higgledy Garden Nigella are doing well. 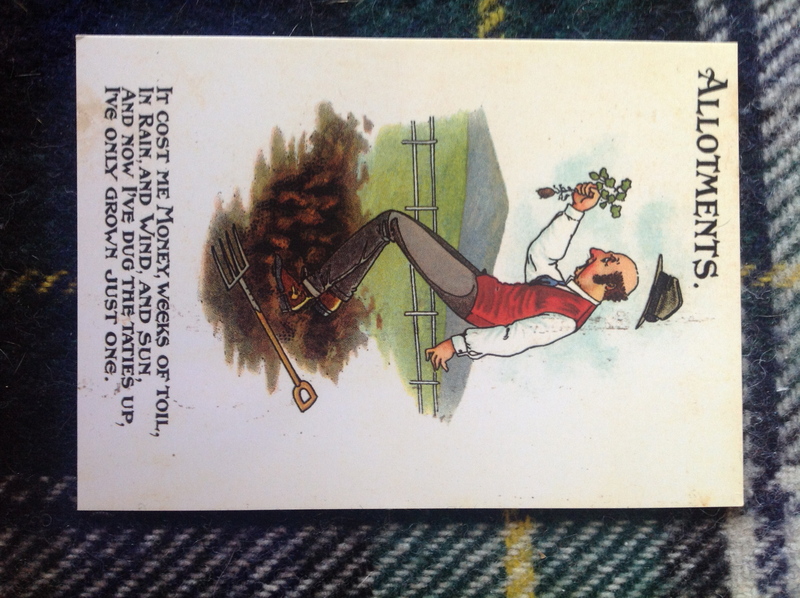 The image I’ve included here is from a postcard I bought from the Garden Museum in Lambeth. I have a feeling this sentiment will be shared! This entry was posted in Adventures in my allotment, In my garden and tagged allotment, English gardens, Higgledy Garden, rain, RHS, Sarah Raven. Bookmark the permalink. I totally relate to your post card. I had a French bean harvest of four -that’s 4 – scrawny beans. I can’t tell you how many times I sowed seeds only to find they had been mowed down by slugs and snails . On the plus side, I had bumper crops of strawberries and apples. : ) Here’s a better growing season next year! Oh dear, I would guess that they were eaten. At least they can be sown again now, and in the springtime. There are plenty of self sown seeds showing on my plot but I held off sowing which I’ll do in the spring. i like your post card… i can understood what you mean…keep writing..